Toys belonging to two young girls were ruined by vandals yesterday afternoon in an incident on Carver Fields. Crosspool mum Lucy Whittle Watkins was out with her three year-old and 20 month-old daughters. They temporarily left a tricycle and toy pram just inside one of the entrances to the fields while they went to sit on a bench. 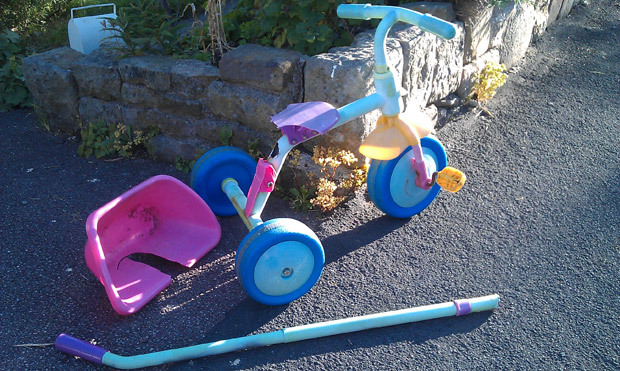 They returned to find the tricycle ruined, with the saddle smashed, the guide pole snapped off and basket broken, leaving Lucy angry and her daughters very upset. She is planning on reporting it to our local police Safer Neighbourhood Team (SNT). If you saw or know anything about this incident then please get in touch with Crookes SNT by dialling 0114 296 4803 or 101. This entry was posted in crime, crosspool, news, police and tagged calver fields, carver fields, toys, vandalism. Bookmark the permalink.